The Star was commissioned to celebrate the 150th anniversary of the Star Music Hall, the building that became Liverpool’s Playhouse. Author Michael Wynne was struck by the popularity of the music hall numbers in his 2014 play Hope Place and suggested that audiences might be up for a show built around them. 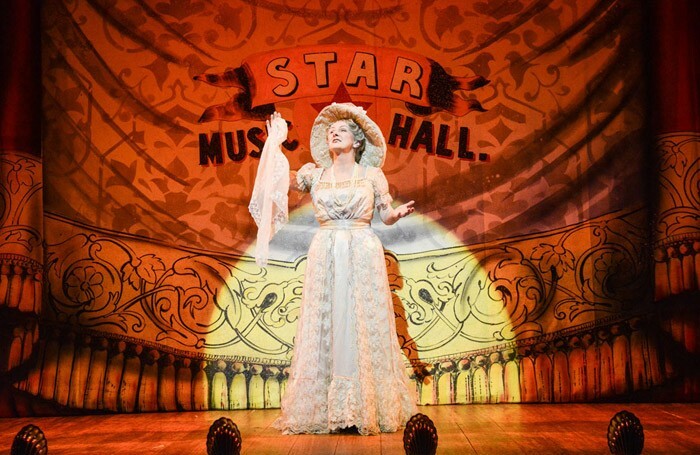 Set front and back stage, the play charts the lives and loves of the music hall performers and staff. Will Michael Starke’s Chairman ever rekindle his affair with Ida Valentine, will Dora the dresser and stage hand Jack find true love, and who’s the sinister fellow lurking in the shadows? Throughout, the ever hopeful comic Arthur Crown searches for a hit act, aided by the long suffering Chairman. With 24 classic numbers the show is very entertaining, and the whole cast have their moments in the follow-spot. Matthew Wright’s set design relies on an enormous quantity of flown scenery, including exquisitely painted cloths. Frequent, complex scene changes take us backstage. The wardrobe department have their work cut out too, with over 80 costumes. Director Philip Wilson finely balances pathos with the entertainment and the entire cast are in fine voice. Eithne Browne and Helen Carter tug at our emotions and Browne’s final number proves surprisingly moving. Meanwhile, Michelle Butterly, Danny O’Brien and Jack Rigby’s songs keep the laughter going. This is more than nostalgia – it’s an affectionate tribute to the era of music hall and a fitting birthday gift to the theatre itself.